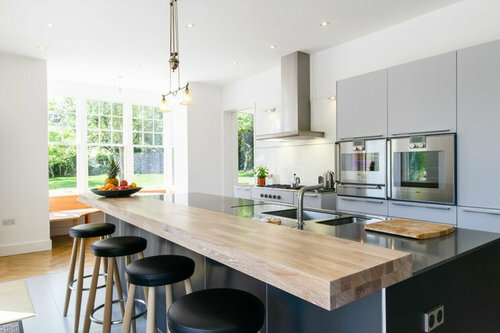 Love the worktop - how thick is it - and where do I get one! Help - first coat on, is it too dark? Hi Travis and SoYoung - thanks for mentioning the fireplace.....I was thinking that I would keep it simple with a wood shelf over it and a large piece of Art but I now think it might be a bit lost. Would love some ideas as it needs to work with the built-ins which are slightly domineering. Also, Liam_Boyle - agree re the unbalance. The TV will be staying but I have a lovely coffee table and 2 identical sofas coming so I'm hoping to lay out symmetrically in the room. Will keep 1 of the chairs. Hope this will balance up. Thanks. Advice on re-design of Kitchen/Diner/Living Room? Hi minnie101, Thanks so much for your detailed reply. Great to know what colour that grey is. It may be a little dark with our floor. We will definitely update the handles - I hate the current ones. We'll probably go with wood to keep within budget. Your non-tiles pic is lovely. We'll probably keep some tiles and try to keep the kitchen a little more modern than country kitchen, which might be a challenge with wood. The room faces south. I like your idea of dividing it with paint. We probably will go with white in the kitchen and then 1/2 slightly darker tones in the tv-couch area. The 'other' entrance into the dining area is narrowed by a non-structural wall, so we should remove this to open it properly or like you say, close it off. Maybe not close it off entirely as we'd lose a lot of light, but maybe put in a counter or breakfast bar if space allowed. I love your pendant light suggestions over the dining table. Details like this and a rug in the couch area will really help divide the room as at the moment it is one big cavernous space. I really can't decide yet what way the couches should face - into a tv in the corner, or out into the room like you suggest. We'll have to draw out some chalk outlines on the floor and see how much space there actually is. Colour-wise we like the idea of keeping walls and cabinets quite stark, the wood counter will add a bit of warmth, and then adding colour with couches, rugs and possibly dining chairs. I've attached a couple of pieces of furniture I like. Some may not work, but we'll figure it out. Every manufacturer that I know of in the U.S. makes a metal piece to cover the space in the back of a true slide in range. If you are having new countertops installed, then you would have a piece of countertop cut for behind a slide in range and install a support piece for it to sit on (2x4 nailed onto the wall). Then it looks continuous around it. I have never seen a true slide in range that didn't have a lip on each side and the back that is supposed to sit on top of the surrounding counters and close up any gaps. Makes me wonder if the cabinets or countertops in this kitchen were raised for some reason so that they are higher than the range. Ranges have adjustable legs, but they can only adjust so far.